Every handyman has changed the electrical plug or socket, as shown in Figure 1, on an electrical cord. We go to our stash of assorted plugs and sockets that we have collected over the years, grab one and install it on the end of a cord or cable. Little if any thought goes into the choice, after all, if it will mate with the outlet or receptacle that we have, then what is the difference? 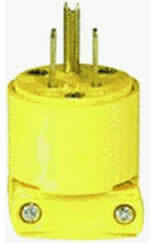 Note: In many cases the socket, is termed a female plug and the item that may be termed plug is called a male plug. 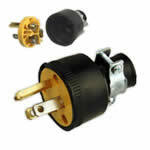 Selection of electrical plugs and sockets . There is a big difference between electrical plugs and sockets. Each plug and socket is designed to meet a specific electrical requirement and the number and configuration of the prongs on the end of a plug or the number of slots and their configuration on the end of a socket is only a small part of the overall specifications of the plug or socket. One of the most important functions in an electrical plug and socket is the devices ability to grip the electrical cable. Because of this, when choosing an electrical plug or socket it is important that the physical diameter of the cable that you are connecting to is taken into account. The method used by the manufacturer of the plug and/or socket to perform the mechanical connection between the cable and the plug or socket varies. Figures 2, 3, 4 and 5 show different methods used on male plugs in order to grip the cable. The actual method chosen by the manufacturer does not matter providing it is utilized correctly when installing the cable into the plug or socket. Some plugs and sockets are designed for connecting round cables, others are designed for flat cables. Cables that are purchased as extension cords often have the plugs and sockets molded to the cable. This makes a very strong bond, providing that the cable is not used as the method of separating the extension cord from whatever it is plugged into. One of the biggest reasons that plugs need replacing is that people use the cord rather than the plug itself to unplug the electrical connection between outlets (receptacles) and the plug or between the plug and other sockets. The electrical cords are not designed to be the grip to make a disconnection. When disconnecting a plug from a socket or outlet (receptacle) the plug and/or socket are the components that should be firmly gripped. 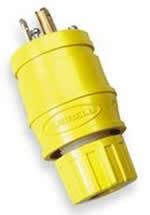 It is not uncommon for damage to the cable to occur at the point where the cable enters the plug or socket. This is usually results from bending the cable at too sharp an angle at the point where the cable exits the plug or socket. The gauge of the electrical wire being connected to the electrical plug or socket must also be taken into account when choosing the right device. The electrical connection screws inside the plug or socket are designed to take a certain gauge or range of gauges of copper wire, usually stranded. If the wire is too large it will not be gripped properly. In some plugs and sockets, the method used to grip the electrical wire precludes using wires of too small a gauge, as they will not be gripped properly.